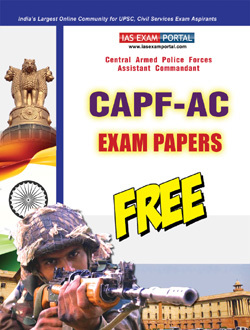 (E-Book) UPSC CAPF (AC) Papers Download | IAS EXAM PORTAL - India's Largest Community for UPSC Exam Aspirants. NEW! CAPF (AC) Exam Paper 2018 - " General Ability and Intelligence"
NEW! CAPF (AC) Exam Paper 2018 - "General Studies, Essay and Comprehension"
CAPF (AC) Exam Paper 2017 - " General Ability and Intelligence"
CAPF (AC) Exam Paper 2017 - "General Studies, Essay and Comprehension"
CAPF (AC) Exam Paper 2016 - " General Ability and Intelligence"
CAPF (AC) Exam Paper 2016 - "General Studies, Essay and Comprehension"